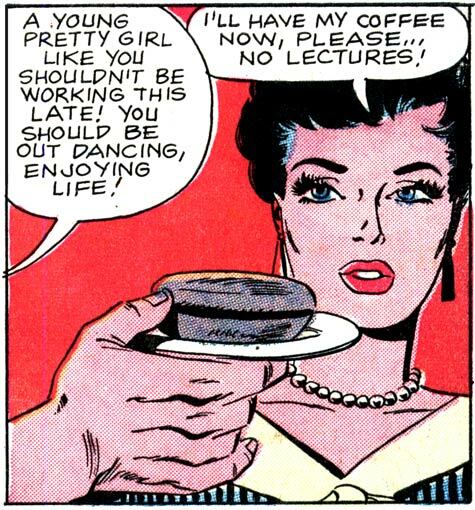 Art by Charles Nicholas & Vince Alascia from the story “Coffee and…a Kiss, Darling!” in FIRST KISS #8, 1959. Are you feeling funny? If so, I’m looking for a funny comment or a funny bit of additional dialogue from either character. Comment below. I’ll be post the winner on Oct. 22. No prizes except my thanks and eternal world-wide reference for your wit! Give this magic crumpet to the one you love and he (or she) will swoon, bow down to your feet and won’t charge you more then 5% over retail after a $25 purchase on select items, restrictions apply. See bottom of crumpet for details and the number of your local Poison Control Center… just in-case. You have the last doughnut dear, that is if you think you can still fit in those pants afterward. Wait…Which cup had the arsenic in it again? (Girl, thought balloon) Besides, you’re not my type. If I could afford to go out dancing, you think I’d be having an English muffin for din-din? His comment: Have a donut, my dear. I glazed it myself! Man: You said you liked my buns, so here, have one on me. Woman: Now I’m wondering about your cannoli!